It’s hard to believe that we have been around for five years already. We certainly didn’t do this all on our own, and we want to express our gratitude and appreciation to those who have helped us to get where we are now. To celebrate this milestone we have put together a fresh pack of psychedelic goodness that brings together some of the top and up and coming artists in the scene. 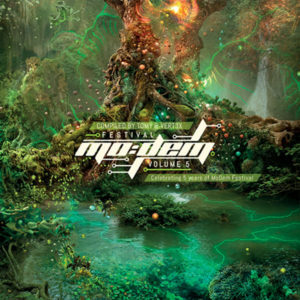 Delivering the best and the latest in underground psychedelic music, loaded with MoDem Festival‘s good vibes and unique raw energy for you to enjoy wherever you go, this is MoDem Festival Vol. 5! Compiled by Tomy & Vert3x. Mastered by EVP @ Wild Mastering. Artwork by Andy Thomas. Graphic Design by Marco Zeta. MP3 Download | FLAC Download | WAV Download · Download count: 24,099. Hah! I haven’t even heard the samples before I pressed the download key! Look at that lineup! Thanks MoDem Records and Basilisk! I need more night time psychedelic, dark or forest….but it’s okay, nice release. My fav is Metaphyz ! Just for the fun, MoDem, with the same cap D in the middle, is also a french little politic party (centre-right) known for its corruption an lack of voters ^_^ Anyway, good music even though not my style (too speedy… or not enough…) I still listen to it with pleasure. Modular Dimensions is a cool one.